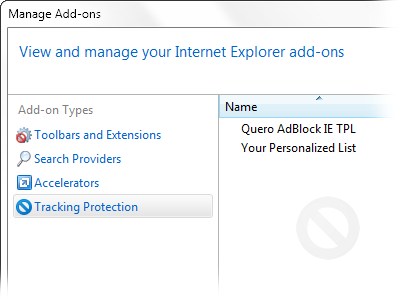 Here is the new ad blocking Tracking Protection List for IE9. To get an effictive ad filter in IE9 I recommend using it together with Quero Toolbar 6 Flash Hider (see blog entry above). This release is a major change to the previous ad blocker, which was part of the Quero Toolbar, leveraging a new built-in feature of IE9 now. The change was necessary since I wanted to say goodbye to the old hacks (which did not conform to the new IE add-on guidelines anyway), and starting with IE9 the IE team is now offering an improved content filter, called Tracking Protection, which allowed me to make this transistion. One limitation of Tracking Protection is however, that it does not block 1st-party content, i.e. content coming from the same domain as the Web site. To mitigate this limitation, I have now also improved the Quero Flash hider. It now selectively hides Flash animations, allowing embedded video players by default. This element hiding technique can also be improved in the future to hide other annoying content from Web pages, which is not possible by a mere URL-based filtering approach.